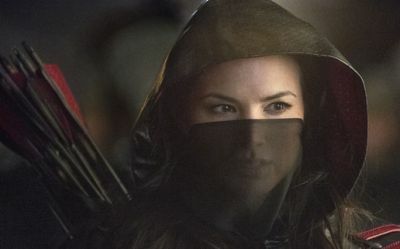 Announced as joining the series back in November, IGN has debuted the first photos of actress Katrina Law as Nyssa al Ghul in the upcoming 13th episode of "Arrow" which you can check out in the gallery below. Executive Producer Andrew Kreiseberg also spoke about what fans can expect from Nyssa in the series and how Katrina Law was cast in the role. "Our Nyssa certainly has shades of Talia. Katrina auditioned for Shado and it actually came down to Katrina and Celina [Jade] and honestly, part of it was just that because we knew she’d have scenes with Slade [played by Manu Bennett], and it just felt like a Spartacus overkill. But she's somebody that we've been a fan of. When this part came up, we saw a lot of people for it, but she certainly is exotic and beautiful and smart and our stunt guys are over the moon, because she can do a lot of her own stunts.Nyssa is the next wave of the League of Assasins that comes to Starling City. But she has some interesting secrets as well…"
"As Laurel continues to unravel, Oliver and Lance try to convince Sara (guest star Caity Lotz) to stay in Starling City and finally reunite with Laurel and Dinah (guest star Alex Kingston). However, Sara’s fellow League of Assassins member, Nyssa (guest star Katrina Law, "Spartacus"), comes to bring Sara back to the fold, but when Sara refuses, Nyssa kidnaps Dinah. Realizing she's putting her family in danger by staying in town, Sara considers re-joining the league."